What I Wore Today: Good Morning Sunshine! Wore this to do some errands yesterday. It was really hot and humid while I was dressing up so I decided to go with a lightweight tee and shorts, but during mid-day, the rain just started pouring down in sheets! Good thing I had my trusty cargo jacket with me cause it got COLD! im so in love with this! 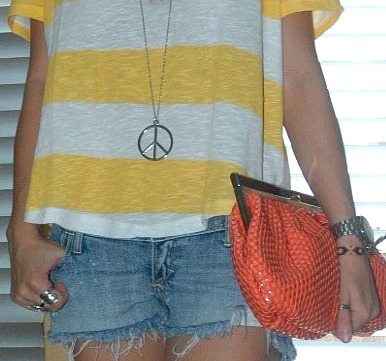 love the top, shorts and shoes!!! I will not blame you for showing off that pair of shoes! They're gorge! And that bright orange purse, just the right pop of color to brighten up even your so called 'predictable' outfits. JC litas can really add spice to any laid back outfit. wish i had your shoes! hahaha great outfit! hope you could visit my blog again. :) thanks! Love the strip and colors! Thanks for stopping by in my blog. Lovely shoes and clutch. This is such a cheerful-looking outfit! I adore the yellow and white stripes. The color looks great paired with that amazing clutch!